I was glad to see a cover image for James Robinson's Earth Two series posted today on http://dcu.blog.dccomics.com/ but have to admit I am surprised to see it featuring Earth Two versions of the big three - Superman, Batman and Wonder Woman. I figured that they would concentrate more on the trio of Alan Scott, Jay Garrick and Ted Grant. It will be interesting to see if the big three will be a regular part of the series or perhaps killed off early on to serve as a motivation for the rest of Earth Two's heroes and a divergence point from the mainstream DCU. I am very glad to see Jerry Ordway getting regular work in the DC reboot, but I kind of wish he was on this Earth Two title... he is my favorite JSA artist, hands down. This cover was tougher to do than I thought it would be. I figured it would be a simple matter of swapping out The Tarantula for Spider-Man, but repairing and replacing parts of the background spider web was a pain! 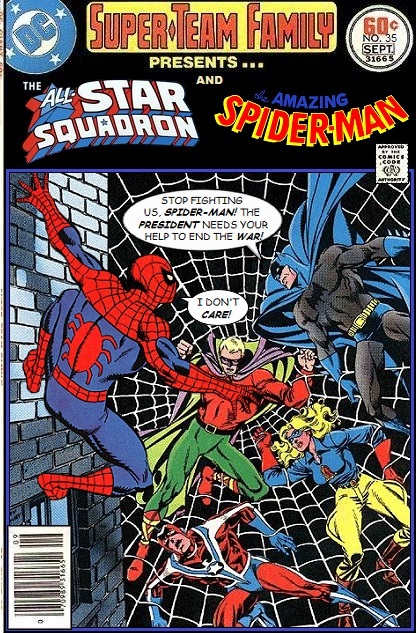 All-Star Squadron was the first team book that I began collecting as a 3rd grader in the early '80s. That series was the root of my later facination for World War 2, Cold War politics, and 19th/20th century international affairs/foriegn policy. The Advanced Placement History Exam in High School was an overview of Roy Thomas' Squadron & Infinity Inc. back issues for me! Oh, Peter! No good comes from tearing up your draft card. Wouldn't Jon Law's Tarantula be a long-lost relative of Peter Parker's? How about teaming the Freedom Fighters with the Invaders? I bet it was hard! Nice work! I love Ordway's All Stars. Sigh. Good times. Spidey, on Silver Age Earth-2, during the Second World War? It must have happened during that time he was trying to return to modern-day NYC after visiting 17th-century Salem, Massachusetts.